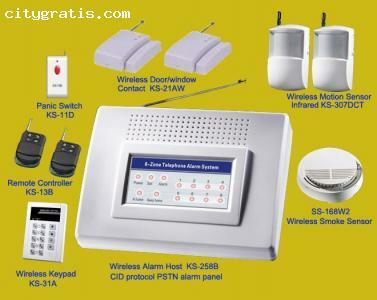 Wirelessplete ALARM SYSTEM WITH 5 WIRELESS SENSORS, 1 SMOKE SENSOR, 2 DOOR SENSORS, 2 PIR DETECTORS, PANIC SWITCH, WIRELESS KEYPAD ARE INCLUDED FOR READY USEAGE. 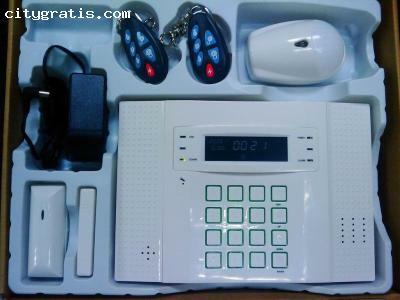 Professional CID protocol alarm systems, 8 wireless (24 detectors) PSTN alarm panel, Home, office,mercial security alarm systems with smoke sensor for fire alarm and motion sensor, door/window protection, easy installation wireless alarm systems with wireless keypad for easy controlling alarm panel. 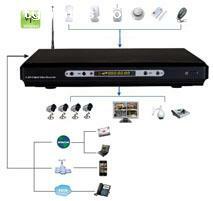 CID protocol PSTNwork alarm panel, auto learning 24 wireless sensors and 8 remote controllers. Can be armed/disarmed remotely via telephone or mobile phone. 1. It is used as home. 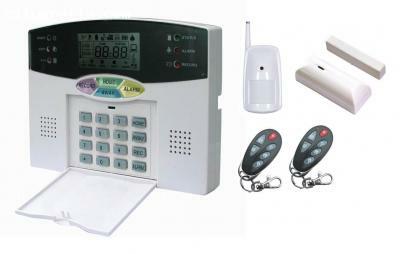 office security alarm host,munity monitor alarm panel. 2. 8 group of telephone No. mobile No. alarm center No. can be set. 3. Protoction zone type can be set as burglar, fire, emergency, medical etc. and can be modified. 4. It indicates when telephone line is cut off or opened. 5. Standby time > 24hours. Wireless smoke sensor used in kitchen, hotel, living room etc. to prevent fire harm. Wireless PIR motion sensor suitable outside (if protected from water leaf).Equipped with an anti-sabotage, thanks to the radio range of 300 meters and suitable for homes, offices, stores up to 3 or more floors. And 'immune to small animals. The opening angle of detection is 90 degrees and the maximum detection distance is 8 meters. Is recorded on the central self-learning system and thanks to a unique code with 500,000binations to avoid false alarms. 3 levels of sensitivity can be set. It works for temperatures between -20 and + 55 degrees. And 'powered by 4 AAA batteries not supplied. Specific and central KS898A KS858E, the dimensions are 110mmx60mmx45mm. And 'including swivel bracket for connection to wall. Maic sensor for the door and / or windows with double internal reed provides two levels of security. Equipped with an anti-sabotage, thanks to the radio range of 400 meters and 'suitable for homes, offices, stores up to 3 or more floors. Equipped with a unique codebinations to 50,000 to avoid false alarms. There is the central self-learning technology. The internal battery life is 4-5 years and in case of battery failure or if, in addition to the LED lights up front, by sending a notice sent to the central Karassn right on your mobile phone. The batteries are of the A23S (type remote control gate opener), ² so readily available on the market. Are included. The sensor is applicable all'infisso bi-supplied industrial adhesive or screws. The dimensions are 3.50 cm x6, x2 00 cm, 00 cm. Radio range much greater than 100 meters in open area and about 100m in the worst conditions. And 'characterized by ease of use through the three function buttons: on, off panic function and early warning. It also allows setting the delay function. Equipped with convenient keychain musket. 1. 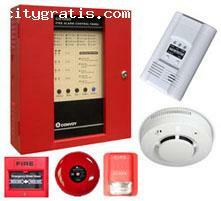 Emergency calling when arm or disarm of alarm system.